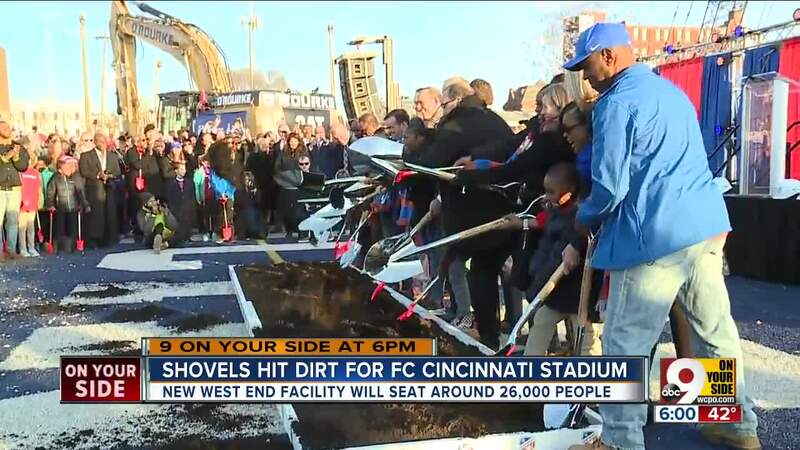 CINCINNATI — FC Cincinnati broke ground on its future $200 million West End stadium Tuesday. There was an air of excitement as various sports and political figures gathered for the ceremony. Workers have already removed what was Stargel Stadium to make way for the new facility, which will seat around 26,000 people. FC Cincinnati supporters lined up outside the stadium site hoping to gain a commemorative shovel from the event. Brandon Yancey was among them. He hasn't missed a match in two years. He said getting to the point of breaking ground was stressful. "For as much fun as it is during the matches, the waiting game and all the politics behind it were a little bit of a pain," Yancey said. "But now it's finally happening and we're excited." The groundbreaking is a big deal for many people. But some in the West End are worried about change, and others are worried about promises to help the entire community. Adar Johnson walked her dog along the stadium site Tuesday, recalling watching her son play football for Taft High School at Stargel Stadium. "I've been here for 14 years. I've seen so much happen on this field. It was perfect for us," she said. "So, this improvement, it may be better, but it's not better for me." On Linn Street, Curtis Martin was busy cooking for customers at the House of Dogs. He's wary of promises made to the neighborhood. "Hopefully they give the jobs to the minorities that's been living here for a long time," he said. "There's just a lot going on right now. All we've got to do is stand by each other and just get through this." There's been some relocation for the project. Just Cooking occupied space in a building that's going to be torn down. A new site hasn't been picked or paid for, so employee Dante Watson is out of a job for now. "I started working for my aunt when she opened six years ago, and it's just been a family business," he said. "We lived together, worked together, play together, cry together." Just Cooking owner Monica Williams has gotten $20,000 from the city so far and is expecting help to open a new site nearby. "I hope so," Watson said. "I need a job, and I have nothing now that this is gone. This is my only income." The club’s future MLS stadium location is expected to be complete by March of 2021. In the meantime, FC Cincinnati will continue to play at Nippert Stadium on the University of Cincinnati campus through 2020.